Barbara Hofbauer needed intensive therapy to regain function and mobility after undergoing a double-knee replacement procedure at Palmdale Regional last June. 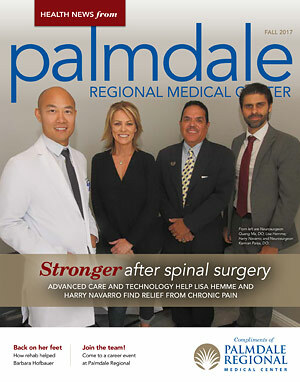 Minimally invasive spinal fusion surgery at Palmdale Regional is providing an effective treatment option for select patients, using advanced nanoLOCK™ technology to support better, faster healing. Here, two patients share their stories. Recovering from conditions like stroke, spinal cord injuries, brain trauma and other serious injuries and orthopedic issues can be challenging. Here, Thomas S. Nasser, DO, FAAPMR, Medical Director of the Rehabilitation Institute at Palmdale Regional Medical Center, explains how inpatient rehabilitation can help.